As 2011 has drawn to a close, and the New Year has begun, it is a good time to assess our progress to date and discuss plans for the future. The company has achieved several significant milestones during the past year. In January, our patent application for on-site production of sulfuric acid was granted. Global Water also began participating in a new water technology cluster that was established in the Indiana-Ohio-Kentucky region to support emerging water technologies. In the second quarter, Global Water released financial information to its shareholders for the first time since emerging from bankruptcy in 2004. This was achieved after the establishment of new accounting procedures and the compilation of two years of unaudited financials. As a result, GWTR stock was upgraded to Limited Information on the OTC Markets and, in December, the company completed the final steps required for maintaining a listing of Current Information. These steps have upgraded GWTR stock to the highest tier for pink sheet companies. Both new and existing shareholders now have a better way to evaluate the company's current operations and future opportunities. 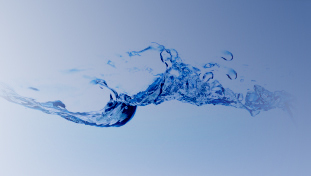 Over the summer, Global Water successfully completed a reverse split and its new shares were approved for electronic trading, an important requirement for companies quoted on the OTC Markets. This was a necessary step and will help the company to avoid any future problems related to restrictions on stocks trading in fractions of a penny. Although the company's ongoing operations are small and generate minimal revenues, an aggressive effort to operate with a very lean cost structure led to a profitable third quarter and the company expects that its full-year loss will be considerably less than in 2010. Likewise, the 2010 loss was approximately half of the loss incurred in 2009. While the company still needs to raise capital for growth, these efforts have provided much greater stability as we move forward. In the fourth quarter, the company announced early leak detection in water mains as an area of interest and it continues to work on identifying procedures to improve water efficiency in this area. Given the increasing challenges of maintaining aging water infrastructure in the United States, the company believes this will be an area that provides significant opportunities for new technologies currently under evaluation. Looking forward to 2012, the company is continuing efforts to increase revenues and grow in a profitable manner. As a small public company with limited capital, Global Water will continue to pursue partnerships where it can identify strategic opportunities to create value through innovative water technologies. Such efforts include its existing non-chemical water treatment through the company's Electric H20 subsidiary, new methods for ballast water treatment and early leak detection in water mains. In addition, the company will continue to work on commercializing its existing patents and other new technologies. Over the past year we have begun efforts to improve the functionality of the ED2000 product line that is manufactured by Electric H20. Initial design work has been completed and this should lead to improved production of the units and wider application of the technology. In addition, Electric H2O provides filtration and other water treatment products through its network of suppliers. At the same time, Global Water has made significant efforts to expand by developing other water technologies. The company targeted ballast water treatment as an area of interest in 2010 and has been working on developing innovative applications for this very large market segment. A promising new technology has been identified and the company is seeking funding to demonstrate its effectiveness for on-board treatment. Although there is considerable interest in such solutions, the process has been slowed by uncertainty over what treatment standards will be mandated by regulators in the United States and at the international level. Another area targeted by Global Water is early leak detection in water mains that results in significant loss of treated drinking water. The company has identified an innovative new sensor technology that can provide an early warning system to better monitor water infrastructure in the United States. Efforts are underway to establish pilot testing of the system in the coming year. In addition to these specific projects, the company has also been working to develop a network of contacts in the water technology space, especially among other emerging entrepreneurial companies. When appropriate, the company may participate in joint venture projects to more rapidly bring new technologies to market. One such partnership was initiated in 2011 and the company is working to further that relationship with a joint venture project in the coming year. Now that Global Water has begun quarterly reporting of its financials, shareholders and potential investors can use both the company's current information and its future opportunities to evaluate the company and its progress. Reaching this level of transparency has been a primary goal since new management took over and it was accomplished in spite of significant challenges and capital restraints. However, regular financial reporting and communications with shareholders is essential to the success of any public company. For many shareholders, measuring the success of Global Water is determined by the price of its stock that is quoted on the OTC Markets as GWTR. Although the company generally does not comment on its stock price, it is worth noting that the past year has seen considerable volatility. In addition to larger swings in the general stock market and even more so among micro-cap companies, GWTR stock also completed a 100 to 1 reverse split in 2011. As a result, the company's stock price moved out of the sub-penny range and, on a split-adjusted basis, it began the year at $.08 and traded in an annual range with a low of $.01 and a high of $.16 per share. After remaining unchanged at $.05 last week, a single trade of 2,000 shares on Friday resulted in a closing price of $.03 for the year. Such volatility in stock price underscores both the risks and opportunities of investing in very small public companies. As we head into a new year, the company is fortunate to have a healthy mix of long-term shareholders who focus on its annual progress and provide stability and also short-term traders who focus on its current share price and provide liquidity. As an emerging technology company, we will continue to focus on creating value for all of our stakeholders. We want to express our appreciation for the support we have received from our shareholders, customers, suppliers, vendors and staff. Thank you for your continued support as we work on building Global Water Technologies during the New Year and in years to come.